Bapu is a master artist and every frame of the movie looks visually stunning,with a beautiful symphony of colours. Bapu has delivered a stunning mythological masterpiece. Screenplay by Mullapudi Venkata Ramana and narration are the movie’s main strengths. The songs have been picturized perfectly in typical Bapu style. Ilayaraja’s music and background score are extraordinary. They are a major asset to the movie and they are appreciated by one and all. Balakrishna looks majestic and regal in the character of Lord Rama. In some scenes, there is a very strong resemblance to his father, Telugu Cinema Legend Nandamuri Taraka Rama Rao garu. His histrionics are spot on and he has delivered a fine and balanced performance. His performance in the emotional moments of the film will win applause. He is perhaps the only actor of his generation who can play such mythological roles. The legend ANR has a full length character in the movie as Valmiki and he delivers beautifully. He gives the key scenes of the movie the necessary balance and maturity. Nayanatara has given what is perhaps her career best performance and she will win many awards for her portrayal of Sita. Technically speaking, this film is superb. It has visual grandeur of international standards and has taken Tollywood to a new league.There was no compromise in quality and best deliverance. 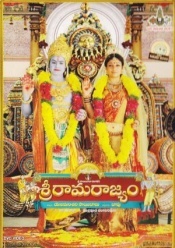 Balakrishna and Nayanatara are majestic as the divine couple of Rama and Sita. Outstanding music and background score, high quality special effects and some very grand visuals make this movie a great watch. Thumbs up for Sri Rama Rajyam. Go and immerse yourself in this divine experience. A grand tale, the story begins with Lord Rama (NBK) returning with Seetha (Nayantara) and his army after victory against Ravana. Everyone is happy in Ayodhya and within a short time Seetha becomes pregnant. In one of the routine information gathering from the kingdom, an incident involving washerman Tippadu (Brahmi) reaches the ears of Rama. The people of Ayodhya begin to question the essence of morality in Rama bringing Seetha after she stayed at Ravana’s place for such a long time. With duty mindedness, Rama sends a pregnant Seetha to the forests. She is given shelter by Rishi Valmiki (ANR) and here she gives birth to twins Lava-Kusa (master Gaurav, master Dhanush). They grow by learning the story of Rama as a noble king and reach Ayodhya to spread his story. However, what they are not aware is the king is their father and even Rama doesn’t realize that when he meets them. But a sequence of events happen which bring Rama to Lava-Kusa. What is that situation and what happens after that forms the rest of the story.